First there was the Acer Iconia W3, an 8” tablet running Windows 8 that was generally panned for, at least, having a terrible screen. 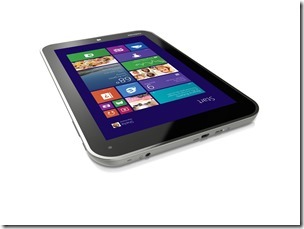 Now, with IFA looming, a number of other small Windows 8 tablets (say, less than 10.1”) are expected for being announced. The Toshiba Encore is the next, and it seems to be better-equipped than the Acer. First, it’s the first device to run Intel’s new Bay Trail Atom processor, which should provide a significant boost in performance over previous Atom processors while retaining the great battery life. Apparently, the screen is also better, although not great compared to some of the competition. However, regardless of the quality of the hardware, I don’t think such small tablets make any sense for Windows 8 (or 8.1) at this point. The reason is simple: there aren’t enough modern UI apps to make a Windows 8 tablet useful, in my opinion (and trust me, I’ve looked), and desktop mode is far too cramped for efficient use on such small screens. Until enough of the right modern UI apps are released, including Microsoft Office, I’d personally never consider any Windows 8 device smaller than 10.1”. Since I spend most of my time in desktop mode in Windows 8 as it is, I think I’d be quickly driven to madness—or, at least, significant eyestrain—trying to use legacy Windows apps on tiny little screens. After using the Dell Venue 8 Pro for a few months, I’ve completely changed my tune regarding Windows 8.1 on smaller tablets. I’ve actually found it to be quite usable, and the Venue 8 Pro is my go-to tablet when I’m doing my most casual consumption and basic research. My Nexus 10 has essentially been retired, and the only other machine I use is my Microsoft Surface Pro 3. But even with the latter being such an excellent machine, I still use my Venue 8 Pro at least a third of the time, if not more. So, disregard everything I wrote above about Windows 8.1 on small tablets. I was dead wrong. What about you? Still have 20/20 vision (or better) and want smaller Windows 8 device? Let me know in the comments.